Let me transport you back to the 1960s, the time of the dictatorship in Portugal. 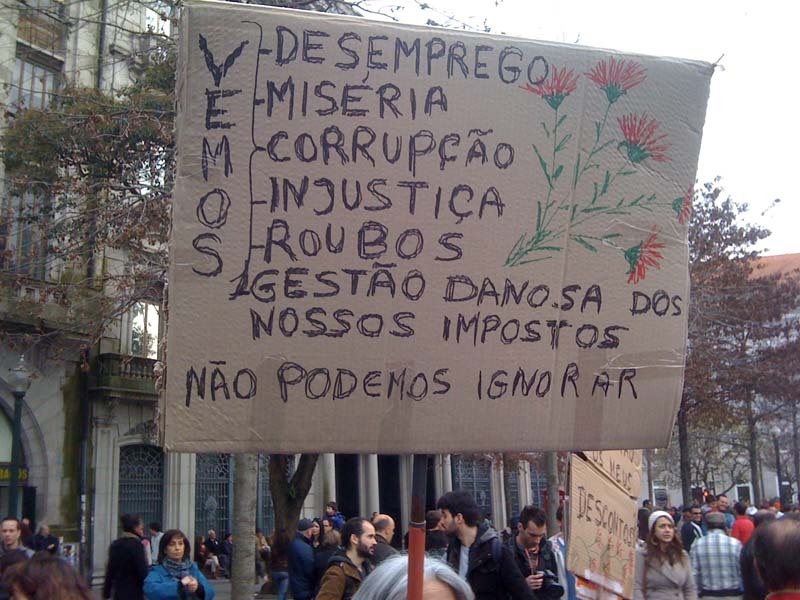 The young of Portugal are disaffected; some are on the streets, others are singing protest songs and many are going overseas. Now let's fast forward forty odd years to 2013. The young of Portugal are disillusioned; some are on the streets, others are singing protest songs and many are leaving Portugal. Plus ça change, plus c'est la même chose, right? Well, you decide as you read and listen. At the end I'll tell you what I think. I have no pictures of students protesting in the late 1960s. The police then saw it as their duty to break up meetings at all costs. Short, raven haired and olive skinned, I looked more Portuguese than most of the students at Lisbon University where I worked. It was clearly no time to wield a camera if I wanted to avoid having my skull cracked by a baton. 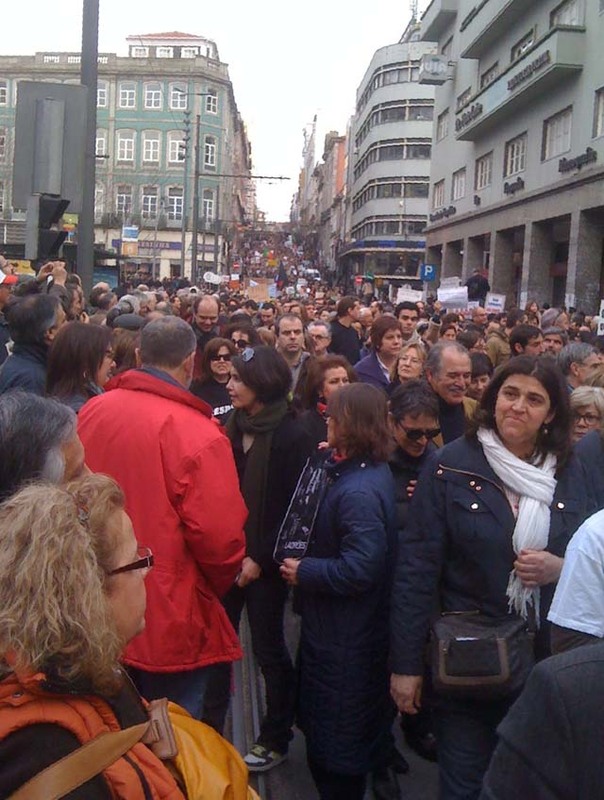 This, however, is a demonstration in Porto in 2013 taken on my phone. There are old, middle-aged and young people in the streets. There are managers, secretaries and recent graduates. Can you see them rioting? Are there any black-clad, helmeted police harassing them? We cannot just ignore this." "Trova do vento que passa", 'The Ballad of the blowing wind' is one of the best known songs of the 1960s. It tells of someone faraway seeking news of his homeland. Despite the wretchedness of the people, however, there is always hope, always someone who fights back. Note the Portuguese guitar, its plaintiveness so much more heartrending than the softer Spanish guitar. To see the You tube video of the song, click here. There are actually many more verses to this poem than ones sung here but I have transcribed only the sung ones. Remember that I am no poet but for those of you who would like to read the words I have made a straight translation. To read both the words and translation, click here. And what of today's protest songs? In the past, although Portugal's most well-known – indeed world famous – singer was a woman, Amália Rodrigues, she sang fado not protest songs. Most women were discouraged from going into the work place because Salazar admired the German view of a woman's rôle in life; Kinder, Küche, Kirche or children, kitchen and church. Now women are out in the workplace, they are on the streets and they are singing the protest songs, once the preserve of men. 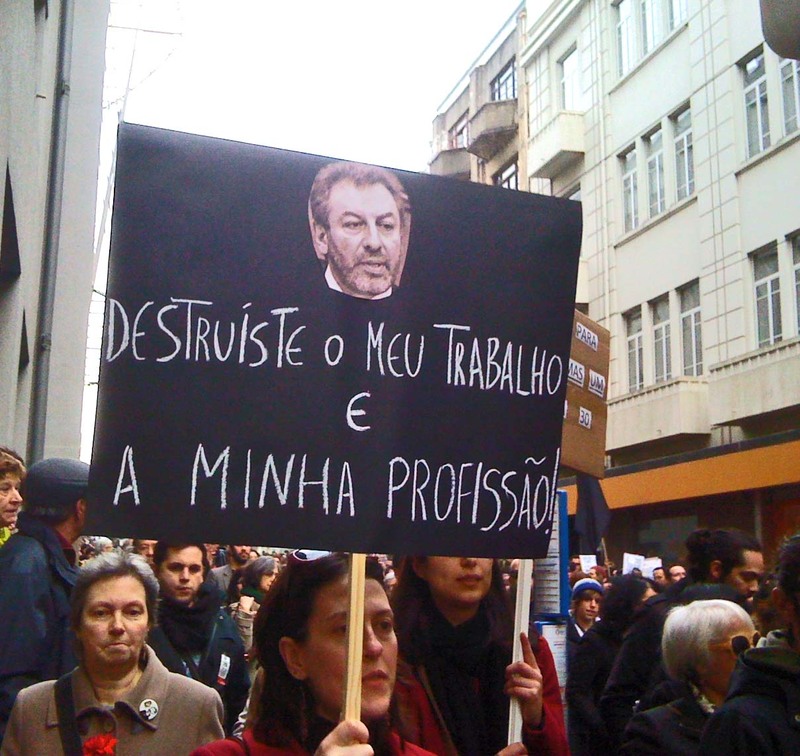 The placard the woman is holding reads; "You destroyed my job and my profession." Now consider this song by a group called Deolinda. When it was first sung it went viral in Portugal. People downloaded it to their phones as their ring tone. Even from the title you can tell that this is an angry song. It's called "Parva que sou" or 'More fool me' sung by Ana Bacalhau. Contrast it with the song above. In the 1960s men, and it was pretty well all men, went unwillingly to Angola, Mozambique, and Guinea Bissau. They were soldiers and they went to fight, all too often to die. Some made the "salto", the 'leap' over Spain to reach France and Germany, where there are still considerable diaspora. They had to make the 'leap' - though hidden in the backs of lorries it was more of a crawl than a jump - because the dictatorship in Spain cooperated with the dictatorship in Portugal and sent any they caught back to Portugal. I imagine they then 'volunteered' to be on the front line. Today the young are going overseas to ... yes to Angola and Mozambique, to France and Germany but also to Brazil. This time their exile is voluntary; they are going in search of work. Angry or sad? Better or worse? To me things are better for all the economic pain the country is going through. It is safe to criticise the government, to show how angry you are, to take to the streets and wave your placards. It seems to me that the the 1960s song is more lyrical than today's popular protest song and, though defiant, is sad rather than angry. In the 1960s Portugal lost many of the brightest and best. They never came home. The same may happen again as it is always those with the most 'get up and go' who actually do get up and go; architects, managers, engineers... Portugal is losing its brightest and best once again. This time their failure to return will be by choice.